The Christmas season is in full swing and one great way to enjoy the holiday spirit is by catching some of the spectacular Christmas performances put on at this time of year. Here are some of the very top shows in the area. At the Dixie Stampede Christmas show, you’ll experience the holiday atmosphere surrounded by Elves, magnificent horses, living toys, and the Sugar Plum Fairy while savoring the aroma of down-home country cooking. Watch the thirty-two horses put on a colorful performance, cheer the Elves as they compete against each other, and be amazed as you watch the living toys come to life. The holiday spirit wouldn’t be complete without the show’s beautifully detailed live nativity scene. Arrive 50 minutes before the main show and get a head start on all the fun at the Dixie Belle Saloon show. Bring your appetite and feast on the four-course meal with all the trimmings while enjoying the on-going entertainment. Another show not to be missed is Country Tonite. Touted as the “Best Show in the Smokies” it’s a must-see experience for the entire family. The show features plenty of singing and dancing, colorful costumes, and comedy skits galore. Sing along as performers bring back memories of times past with country classics then get your feet stomping when singers perform some of the hottest hits on the country charts. You’ll hear gospel and bluegrass music and patriotic songs dedicated to those who keep our country safe. State-of-the-art lighting and sound, plus two mega-sized video screens guarantee you won’t miss a beat of a song, a step of a dance routine, or miss the punchline in the comedy acts. Country Tonite is upbeat and fast-paced and will keep you smiling throughout its two-hour show. Christmas at the Smoky Mountain Opry brings holiday cheer wrapped up in packages of live holiday music, dazzling dance performances, elegant aerial artistry, magical moments, and the timeless tradition of reenacting the nativity scene on stage complete with live camels. At this Christmas show extravaganza, the sky’s the limit when it comes to total entertainment at the well-orchestrated variety show. Throughout the production, the holiday spirit is evident each time a new performer takes the stage. The show is geared for all ages from start to finish. Enjoy music from the huge live band playing a variety of tunes amid brilliant Christmas laser lights while Elves and Jolly Ol’ Saint Nick show off their dancing techniques. Flying Sugar Plum Fairies glide through the air while enchanted reindeer watch and living toys come to life making the show a Christmas delight for children. Last but not least, Dolly Parton’s Smoky Mountain Adventures is a holiday treat that combines a delicious dinner with an array of live entertainment. The show serves up ample portions of fun and Christmas cheer along with generous servings of fried chicken, sugar cured ham, freshly made biscuits, fragrant stuffing, and succulent corn on the cob. Both your visual palette and your tasting palate will be satisfied after experiencing Dolly’s adventures. This year’s Christmas production brings the holiday to life with an amazing display of multi-dimensional projection lighting that turns the stage into a picture-perfect rendition of a magical winter wonderland. Arrive early so kids can get a magical makeover and become a reindeer, elf, or other Christmas character then head to your seat an enjoy the sounds of holiday music. 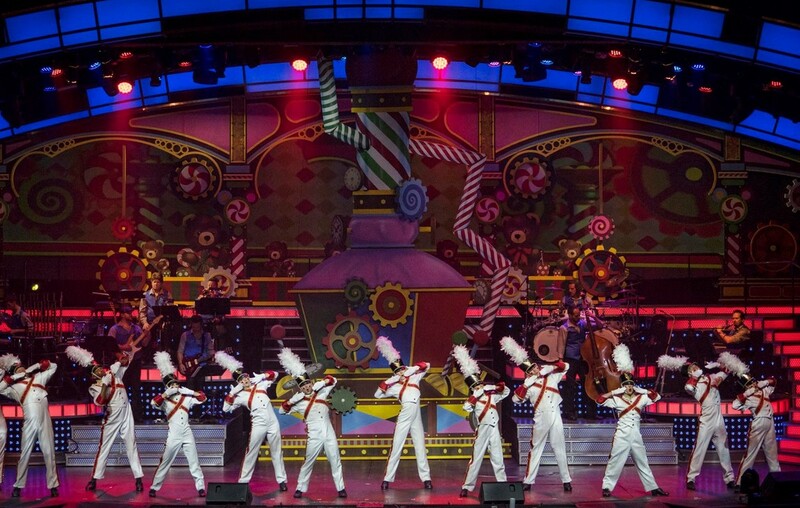 Throughout the show, you’ll see creative figure skating, acrobats flying through the air with the greatest of ease, a Bluegrass nutcracker, busy Elves, holiday jugglers, a visit from Santa, and performers creating the nativity scene. And as a bonus, Dollywood also has a full playlist of shows during the Christmas season – check our guide to Christmas at Dollywood for details.